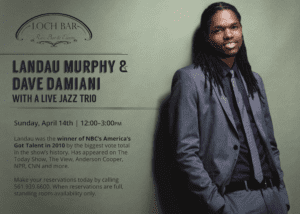 We’re excited to welcome Landau Murphy, Dave Damiani & a jazz trio to Loch Bar for a special Sunday afternoon concert! The show will begin on Sunday, April 14th at 12pm and end at 3pm. Guests are encouraged to call ahead to book their tables. After all table reservations are booked, it will be bar and standing room availability only. Please call (561) 939-6600! Landau Murphy was the winner of NBC’s America’s Got Talent in 2010. Wowing the judges with his back story of homelessness and determination to succeed for his family, coupled with interpretations of classics from Cole Porter, Dean Martin, Frank Sinatra and others, Landau walked away with the million dollar grand prize in front of 14 million weekly viewers. According to show insiders, when all was said and done, Landau had won America’s Got Talent by the biggest vote total in the show’s history. He has appeared on The Today Show, The View, Anderson Cooper, NPR, CNN and more. Dave Damiani is an American singer, songwriter, producer based out of Los Angeles, CA. Having started as a bartender at the famed CHARLIE O’S JAZZ CLUB in Valley Village, CA, Dave Damiani had the opportunity to work, learn and become friends with some of the best musicians on the planet. Legends like Earl Palmer, Marty Harris and Ross Tompkins took time to mentor Dave Damiani, share stories and chord changes. 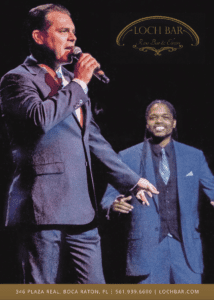 Dave Damiani has performed for: Leonardo DiCaprio, Ryan Seacrest, Gene Simmons, David Spade, David Hasslehoff, Jack Klugman, CBS , ABC , FOX , Polo, The Four Seasons, Ritz Carlton and The Beverly Hills Hotel.